Toddlers (and older kids too!) love to be down on the floor, playing and exploring what is immediately in front of them. They are active, joyous little sponges and are only a glimpse of the bright little preschooler they will soon be! My first born was barely able to walk it seemed before we had the arrival of our second and I was always looking for ways to spend time with and enterain my little toddler while the baby slept, er...ate, er...well you name it! We had purchased a role of butcher paper from a teacher supply store (They now sell them by the role at places like Target). I didn't want to put it up on the wall because I knew...I just knew she would then want to color on the wall when the paper wasn't there. So we spread it out across the floor (Sad but true, our old kitchen apartment was so small, the small section of paper almost covered the entire kitchen floor!). We grabbed some crayons and colored on the floor to our hearts content! Ironically, at that age, my daughter loved watching me color almost more than she loved coloring herself! 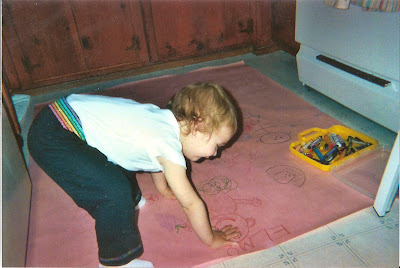 She would beg me to create horribly ugly likenesses to Elmo (It's the one she's bending over to touch!) and other lovable characters. We kept our colored masterpiece on the floor for a whole week- adding to it a little more every day! So, the next time you and your toddler are out of ideas for playtime, get down on their level, literally! What a great idea! My boys would love this. I'll have to check out Target for the paper by the roll. I have bought it at Smart and Final for cheap! I use it to line table for parties, etc use it for EVERYTHING! Such a fun memory, and I love the picture! !